"For a long time David Young has been one of the clearest and most respected writers on New Zealand ecology, a champion for what its people hold in trust. He now brings a novelist's eye and voice to his story of pakeha settlement, plaiting his Scottish migrants into the weave of a 'new' land, and their engagement with what was already here. This is the story not of 'man alone' but of 'men together', for better or worse; of a country inherited and a country transformed. If you ask what it might mean to become a New Zealander, 'Coast' and its generations will take you a long way towards an answer." 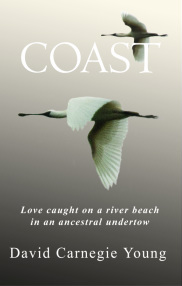 COAST is a unique novel that sets up a resonance between a departing shore in Scotland, and a receding shore, in New Zealand. The story begins with a Scots ploughman from the Mearns, who is confronted with a new and sometimes volatile environment in coastal Rangitikei-Whanganui, New Zealand. The promise and opportunities within a Scots community in his new home are ultimately robbed from him by the war on the Western Front. However, the relationship he has established with this memorable coastal landscape connects fathers and sons through three generations. Visiting Scotland to research this novel – a novel based on a Scottish grandfather he never knew - David arrived at St Cyrus in the North East Mearns. Here he found a coastline with resonances of the shifting estuary, dune country and rich birdlife from the coastal landscape of his childhood at Turakina, New Zealand, 18,000 kilometres away. The story spins from there, exploring how a coastal environment might heal the after effects of trauma experienced by those who fought in war. Told by three inter-cutting voices, the narrative raises questions about war and its impacts on fathers and sons long after the fighting has finished, of the tension between community and freedom, of family and belonging, the relationship of tangata whenua to the landscape and the redemptive power of love. Ultimately, the novel is a love story, less of the classical man-woman theme than that of a son for his father, and for the magic of wild country. David Young connects his lifelong fascination with water, memory and landscape. Coast is unavailable. A reprint maybe considered in the future. The author researched the effects of war on men and their children extensively. His father, Philip, was also essential to this story, both informally and consciously. Supplied with an electric typewriter to record his memories, and aided by a diary he kept during the air war in the Pacific, Phil provided written memories that offered a foundation, as well as historic detail, for what became a central character of this novel. It is not only his father’s wealth of language and expression but also his good humour and merriment in re-telling past exploits that added to the richness and imagery of the novel. Beyond that, Coast is entirely a work of fiction - an original narrative - but pegged to some identifiable historical events and figures.